Dr. Alfred Webre -  An epic journey of new discovery so fantastic that our natural instinct would be to block it out. 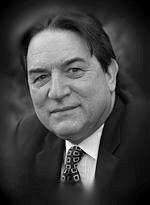 Alfred Webre is a space activist who works with others to prevent the weaponization of space and transform the permanent war economy into a peaceful, cooperative, democratic Space Age society, re-integrating with a larger, intelligent Universe society. an On-Air Host on Vancouver Coop Radio CFRO 102.7 FM . Webre was General Counsel to the NYC Environmental Protection Administration and environmental consultant to the Ford Foundation, futurist at Stanford Research Institute, and author. Mr. Webre produced and hosted the Instant of Cooperation, the first live radio broadcast between USA and the then Soviet Union, carried live by Gosteleradio and NPR satellite in 1987. "Alfred Lambremont Webre's odyssey into the realm of life in the vast Universe surrounding planet Earth is indeed a fascinating journey if you read it with an open mind... To turn us in the direction of re-unification with the rest of creation the author is proposing a 'Decade of Contact' - an era of openness, public hearings, publicly funded research, and education about extraterrestrial reality. That could be just the antidote the world needs to end its greed-driven, power-centered madness." Exopolitics, as the name suggests, is extraterrestrial politics. Exopolitics is a direct logical extension of conventional politics to the interplanetary theatre. Dr. Alfred Webre, who formally introduced exopolitics as a discipline of study, defined it as the study of law, governance and politics in the Universe. The need for exopolitics arises naturally. Once one accepts the existence of other sentient beings besides ourselves in our immediate neighborhood (which for the purpose of this discussion can be defined as the solar system and nearby stars), it becomes necessary to look at our neighbors politically. Like any sentient beings, they naturally have to have their own needs, desires, interests and agendas. By analogy with political parties on Earth, which are aggregations of individuals who share a certain common political agenda, i.e., a certain set of policies they mutually seek to bring about, we can introduce the notion of an exopolitical party, which we shall define as any grouping of members of the interplanetary community with a specific exopolitical agenda, i.e., a specific set of policies toward other members of the interplanetary community. The main job of exopolitics research then consists of identifying the existing members of our immediate neighborhood and classifying them by their exopolitical agendas, thus establishing a picture of the existing exopolitical parties in our immediate neighborhood. Written by Yale graduate and whistleblower Alfred Lambremont Webre, this startling book examines the idea that humanity lives on a planet in one universe that exists in a multiverse that in turn is part of an Omniverse. Webre, a leading thinker in the field, details his arguments with simple and stunning clarity. In 2000, author Alfred Lambremont Webre released his book, Exopolitics: A Decade of Contact, which founded Exopolitics, the science of relations among intelligent civilizations in the multiverse. 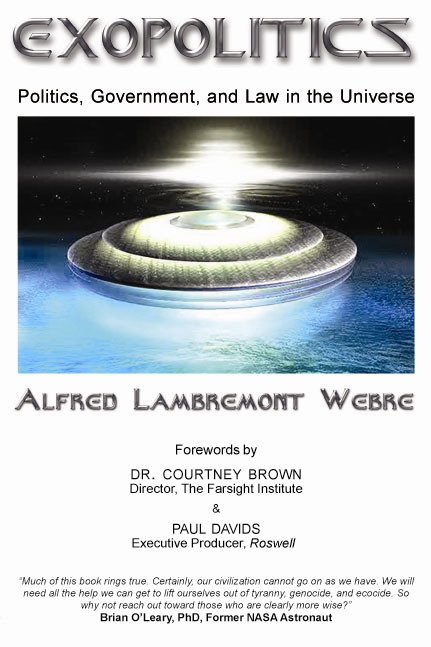 Immediately, Webre became a leading extraterrestrial and time-travel whistleblower and as a result, attracted a lot of attention from both the scientific and political communities. With The Dimensional Ecology of the Omniverse, Webre cements his role as the developer of the Exopolitics and Dimensional Ecology models of the Omniverse. As Webre points out, the details of his book are vital to help readers understand the connection between science and spirituality.